When I say surviving December, I’m not talking about the normal Christmas/Holiday of your choice madness. There’s very little of that at my house, and I’m surviving just fine, thank you very much. No… I’m talking about just physically surviving what Mother Nature continues to throw at us. Thursday we had another of those storms of the Decade/Century/a long time, featuring high winds, soaking rains, downed trees, etc. Thursday as I left work and drove towards Tangle for Thursday Night Knitting, I could see transformers going out in the hills above. It looked like the 4th of July, with huge, bright blue and green flashes. I had heard on the radio that a main road near my house was closed because 4 or 5 trees had come down across the road, so I was relatively certain that my power was out. The wind was whipping and tree limbs were coming off around me and things were blowing down the street and the rain was lashing everything and I probably should have been driving straight home, power or no power. I needed Noro to knit the hat for the gift exchange on Monday. Strangely enough, I have no Noro in my stash. What would you have done, gentle reader? I dashed into Tangle. Noro in hand, I settled down in a chair to work on the Snake River socks, at that time nearing completion. There were only three of us intrepid knitters there, willing to brave the weather. Every now and then I looked outside to see trees whipping back and forth. But with no power at home (probably) why go there? But… I have to drive home down tree-lined streets. At around 8:00 PM I decided I’d better wimp out and head for home, because it might take me a while to get there. It was an interesting drive. Several roads were closed, and some parts of the city went dark as I drove through them. I looked up ahead and couldn’t see the lights on my little mountain, so I knew I was right about my power. We are experiencing a power outage in your area. Approximately 5,000 homes are affected. We have received calls from 3,243 locations. Due to the nature of the outage, we do not have an estimate when power will be restored. I settled down to knit with a flashlight balanced on my shoulder. There were actually about 500,000 homes across Oregon that lost power. Some people still don’t have it back. I was lucky! It was back by 10:00 PM that night. The fence came down last night. I think the wind, combined with the alternating freeze/thaw and the huge amount of rain we’ve had the last couple of months just finally did it in. The uprights rotted at ground level. Much of the rest of it is about to come down, too. It’s been there for 10 years. I haven’t talked to my neighbors yet, but we’ll work something out about replacement. The shiny gold bits on the ground in the second picture are what’s left of a reflecting globe I had in the back yard. It’s the only casualty besides the fence. I’m very lucky considering the damage to some homes. It’s fun to see what people have in their back yards. Whodda thunk my neighbor would have a concrete cherub? 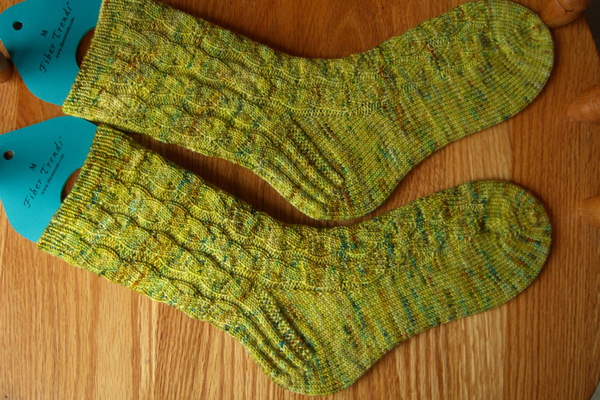 The Snake River Socks are finished. There’s still not much light — we’re having freezing fog right now — and this is the best I can do for pictures. I’m really pleased with the way that these turned out! The stitch pattern looks really complicated and cable-ish, when in reality it was simple increases and decreases. I love the color, too. And they fit perfectly! I included the close-up of the heel because I’m quite proud of how it came out. Note how the garter border on the heel flap joins up with the purl stitches in the pattern and the knits stitches sort of flow next to it? Not bad, eh? I was going for sort of a waterfall effect on the heel flap, with the garter stitch representing moss-colored rocks edging the stream. Fitting in with the whole river theme. 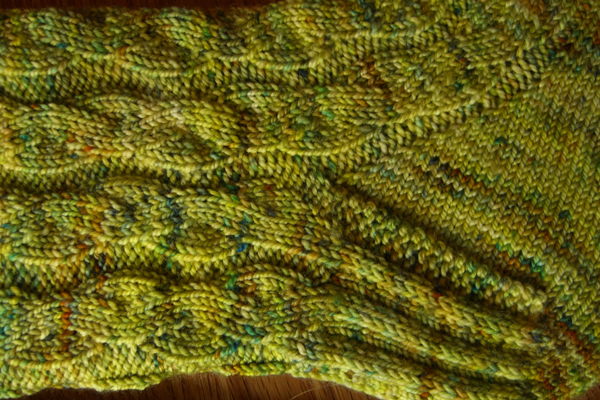 I wanted to include a close-up of the ribbing at the top, but neither the camera nor the socks cooperated. Hopefully you can see from the picture how the stitch pattern separates and then rejoins, eventually merging into a 1×1 rib… sort of like a stream rippling over rocks. Or that’s what I was going for, at any rate. These are going to be on my feet today for sure! And maybe tomorrow and the next day, too! I’ve started the Noro hat and will try to post a pic tomorrow.